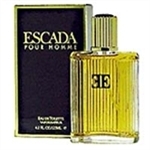 I accidentally ordered the wrong Escada smell for my husband. He likes the summer one, but this one smells really good, except it is a little strong, so you don't want to go overboard when you spray it. This was recommended to me as a lighter, more sophisticated version of English Leather and became my favorite fragrance. This is a very "fresh" cologne, yet masculine; I've gotten many compliments from my lady friends and female co-workers. Definitely a favorite !